My daughter and I popped into the Victoria Market today to get some fresh fruit. It was so hot today and we were both very thirsty. We stumbled into Minh Phat (will need to check the spelling or that later) which is the asian grocer across from the markets. This place is awesome - jam packed with heaps of asian groceries. I am usually here once a week. 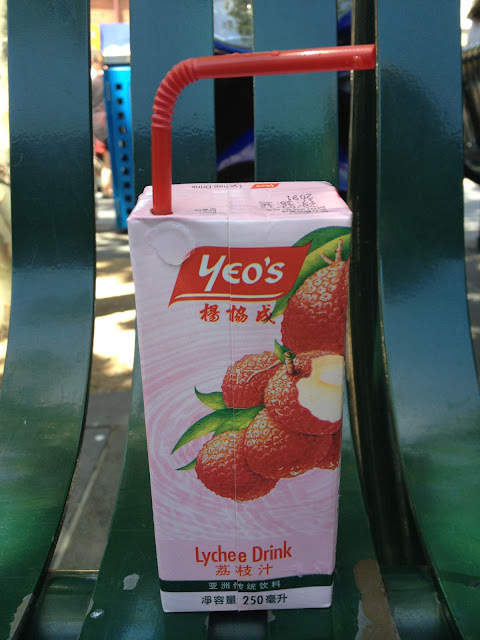 Anyway I was looking for something different to drink that I could share with Charlie and thought I would give Yeo's Lychee drink a go. If you like lychees this is a lovely drink. I did not check out the sugar content as we were too busy drinking it (or should I say I was too busy trying to steal it back from my daughter - she is a bit of a hog when she likes something) but at this point I was beyond caring. It was $1.20 and it was cold which was a win win for me on this super hot day.